Getting Erdoğan to positively contribute in areas of mutual interest should be a priority in Washington. Turkey's President Recep Tayyip Erdoğan has been experiencing life the hard way in recent years and if his recent White House meeting is any indication, he hasn't learned many lessons. After eight years on the receiving end of president Barack Obama's mixed messages and reversals on Syria, he professed a desire to turn the page with the Trump administration. His most important task was to convince the U.S. to partner with Turkey rather than the Kurds in the war against the Islamic State (ISIS) in northern Syria. Short of that, he at least wanted a pledge that the Kurdish-dominated Syrian Democratic Forces (SDF) would withdraw from key areas around his southern border in the wake of the fighting. Erdogan also hoped to get a presidential commitment to a Syrian future that excludes Syrian President Bashar Assad. Regionally, he wanted to enlist America's assistance in his quest to expand the Turkish zone of influence in northern Syria and Iraq in the face of Iran's aggressive westward expansion and in the vacuum left by ISIS. Finally, if possible, he hoped to convince the U.S. to turn over the exiled Turkish cleric Fethullah Gülen, whom he blames for the abortive July 2016 coup. An agreement on any of the above would be a significant achievement for Turkey. Instead of positively responding to Trump's outstretched hand, a few hours after his White House meeting he watched his security services respond with clenched fists and several kicks as they assaulted peaceful demonstrators in northwest Washington, DC. The brawl, which was captured on video by several news outlets and beamed out across the world, does not bode well for the future U.S.-Turkey relationship. Unfortunately, the unsavory cast of characters that Erdoğan holds court with is not limited to his security detail. He actively supported the Muslim Brotherhood in the wake of Hosni Mubarak's overthrow in Egypt. In fact, he saw the election of Mohamed Morsi as an affirmation of the kind of Islamic rule he hoped to bring to Turkey. But Morsi's premiership was short-lived. He was overthrown and arrested in June 2013 by the military after just a year in office, following massive demonstrations. Erdoğan took it as a personal loss and rather than repairing relations with Egypt, he turned Turkey into the regional hub for the Muslim Brotherhood's International Organization. Egypt did not forget. 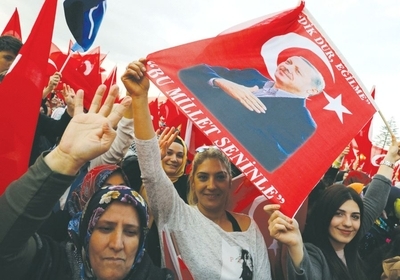 During the 2016 attempt to topple the Turkish leader, its media prematurely celebrated his overthrow, and it blocked text at the United Nations considered too supportive of Erdoğan. Erdoğan also openly supported Hamas, including the so-called "Freedom Flotilla" in 2010 designed to spark an international incident with Israel. A Turkish group with close relations to Erdoğan and the Turkish government funded the effort. The organization was also part of a larger umbrella group that was, according to Palestinian intelligence, "one of the biggest Hamas supporters" when it came to material assistance. Nor has that support changed since Erdoğan's White House visit. In a recent congratulatory Ramadan phone call to Hamas leader Ismail Haniyeh, Turkish Prime Minister Binali Yildirim promised that Turkey will continue to scrutinize Israeli settlements and so-called violations in Jerusalem, saying, "We are exerting efforts in this regard at different levels." Not known for his diplomatic niceties, Erdoğan also has a long list of those he likens to Nazis, including the Netherlands, modern Germany, and the European Union. Of course, Israel is also a charter member of that group as it has "surpassed Hitler in barbarism," according to the Turkish president. Nevertheless, it is the Kurds – not the Nazis – that he sees as his number one enemy. He has bombed their bases in Syria and actively undermined them in their battle to recover lost territory from ISIS. In fact, he preferred to allow a stream of tens of thousands of Kurdish refugees to enter Turkey rather than allow Turkish Kurds to cross into Syria and help their brethren. Such was the case in the Kurdish-held border town of Kobani in 2014 when it came under a sustained ISIS assault. While there are many reasons for the emergence of ISIS, it could not have grown, survived and thrived to the extent it has without Turkey initially turning a blind eye and then actively supporting it. That effort, however, not only failed to topple the Assad regime, but the growing rash of ISIS terrorist attacks inside Turkey demonstrate the degree to which such a policy became a double-edged sword. Erdoğan's pursuit of "the enemy of my enemy is my friend" strategy by which he relied on ISIS to battle the Kurds and Assad on his behalf also backfired, creating the precise dynamic he sought to avoid with the U.S. After all, the U.S. allied with the Kurds because they are the only capable fighting force dedicated to defeating ISIS as their primary objective. Turkey's poor choice in partners pushed the U.S. toward them. After years of rolling diplomatic snake eyes at the Middle East craps table, the only state Turkey can boast of warmer relations with is Qatar, which has come increasingly under U.S. scrutiny for its material support of the Muslim Brotherhood and terrorist groups such as the al-Qaida-affiliated al-Nusra Front, Hamas and others. In a further sign of both Ankara and Doha moving away from Washington, Turkey has been building a military base in Qatar that could host up to 3,000 people – a strange investment given that the small Gulf state already hosts America's Al Udeid air base, from which the U.S. directs coalition air operations against ISIS. Turkey is, after all, a member of NATO. Unless they have a plan for force projection outside the Western alliance, such an investment appears redundant. U.S. President Donald Trump turned the page on Obama's Middle East policies in his recent visit to the region. The question remains, can he do the same with the American-Turkish relationship? Turkey is destined to play an important role in the region. Getting Erdoğan to positively contribute in areas of mutual interest should be a priority in Washington. If the past is prologue, however, he is bound to continue making costly bets on the wrong horses that will likely create significant regional obstacles for the Trump administration. Should that behavior persist, the U.S. and NATO will need to adjust their carrots and sticks to ensure the appropriate lessons are finally grasped in Ankara.